BOSTON, Mass. - Trailing 1-0 entering the third period, the No. 12 Northeastern men's hockey team (15-8-1, 9-6-1) clawed back to tie the game with 11:36 to play, but UMass Lowell (15-8-2, 9-4-2) struck with 4:59 remaining and added an empty netter to edge the Huskies on Friday night at Matthews Arena, 3-1. It was a battle of the netminders for most of the evening as UMass Lowell's Tyler Wall steered aside 26 of the 27 shots he faced, while Cayden Primeau was strong at the other end with 26 saves of his own. Kenny Hausinger put the visitors up 1-0 less than three minutes into the second period when he redirected a Seth Barton shot on the doorstep past Primeau for his ninth of the year and a 1-0 River Hawk lead. The score remained that way until midway through the third period when the Northeastern power play broke through. Jeremy Davies began the play in the defensive zone before alluding several River Hawk defenders and entering the attacking zone. There, he played catch with Brandon Hawkins, resulting in a pair of shot blocks before Hawkins scooped up the loose puck and rifled it home for his eighth goal of the season and team-leading 22ndpoint. 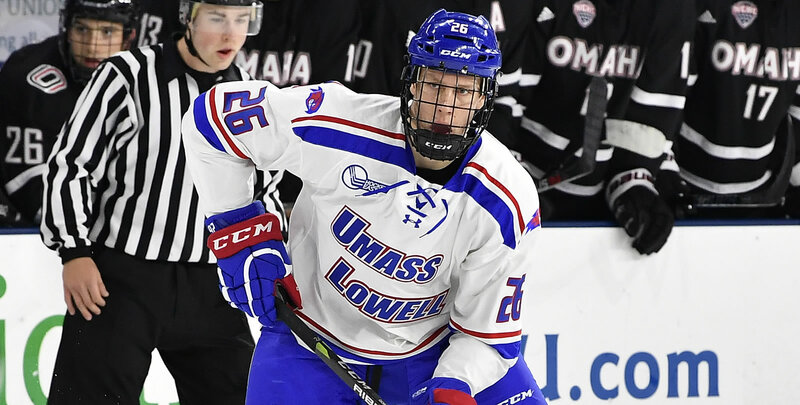 The squads went back and forth before UMass Lowell went ahead for good on a scramble in front as Chris Schutz tipped a Mattias Goransson shot at the point, and Ryan Lohin was waiting on the post to tuck it home for 10thof the season with less than five minutes to play. The Huskies pulled Primeau late in search of the tying goal, but UML iced it as Reid Stefanson buried one from 150 feet away to seal the victory. Northeastern will regroup quickly before returning to action on Monday at the 67thannual Beanpot. The Huskies will square off with Boston University in semifinal action at 8 p.m. on NESN.